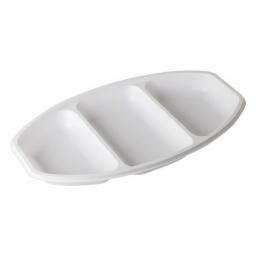 Thali Outlet offer a full range of plastic platters and lids for all your serving needs. From mini platters to gold classic display platters to value pack platters with lids, we have it all covered. To make your buffets festive and show off your culinary creativity, the functionality and aesthetics have been specially studied in the creation of our platter offer. For this collection, we have done our utmost to imagine a multitude of complete solutions. 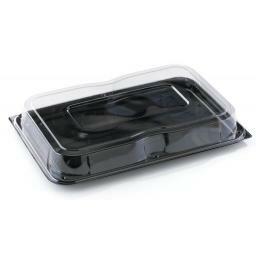 Take a look at our disposable plastic food platters, consisting of mini, small, medium and large sized black plastic trays with clear lids, as well as our slate-look and glass-look plastic platters with clear, press on lids. Bring value to your high-end preparation by using the appropriate packaging. The Sabert platter range with clean lines and minimalist curves will instantly highlight your meal. This collection of small rectangular black platters and lids are ideal for sushi, nibbles, mini-desserts or any other food prepared with love and talent.